Home » Blog » Is social selling a good excuse for not visiting customers? Should social selling replace customer visits? ‘ is a resounding ‘no’. I am under the impression that lately, the world of sales and marketing has gone crazy. In reality, too much of the social selling activity leads to social media bores. According to Mark Schaefer, marketers have a knack for using technology for being more annoying. It’s high time we rethink social selling, and I must admit that the recent developments made me reflect on a few things: the relevance of our business and ethics, the meaning of sales and lastly, the actual definition of social selling itself. Here are some thoughts on the subject, and my advice to salespersons, sales managers and marketers with sound brains. Sales is extremely difficult and requires energy and proactivity on the part of the salesperson. Yet, learning how to let go is even more important and something that salespersons should pay heed to. Being a good salesperson implies avoiding Joes Isuzu’s hard selling methods at all costs. Recently, The Joe Isuzus of this world decided to swamp social media platforms — namely LinkedIn — with their so-called social selling approaches. This is not doing anything to improve the perception and image of sales persons. – A salesperson, or even worse, “business developer”, who contacts you immediately after you have accepted her/his connection request on LinkedIn. It’s irritating, especially if you have no chance in hell of ever being one of her/his customers. – A sales person who sends you her/his sales pitch and drowns you in information in copy-paste manner through an inmail, without even bothering to call you Sir rather than Madam (or vice versa depending on circumstances). – Third example, the sales people who scraped your email address by scanning LinkedIn after adding you in for a connection and includes it in his newsletter without your formal permission (in other words, who spammed you shamelessly and regardless of laws and ethics). I could go on like this forever. Although I stopped being a customer five years ago, I am still being annoyed on social media- mainly LinkedIn. I can imagine what customer-side decision makers are going through. Many of these annoying salespeople’s products or services would actually be the solution to a considerable number of problems, yet, such methods are so unrelenting and brutal that they tend to be counterproductive. Grow your social selling index and become a sales Czar! I know sales people from major US IT businesses who are pressurised by their management to grow their social selling index to fulfil the sales objectives. Beware of that: salespeople — and I was one of them once — are always keen on circumventing managerial decisions for their own benefit. 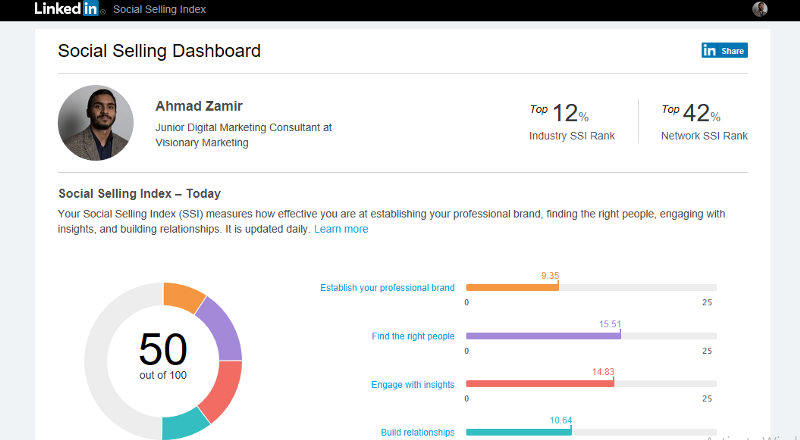 To grow your SSI, you do not have to be influential, just hook up on LinkedIn and follow the checklists (see the figure below). Personally, I’m rather bad at this. It’s understandable, I spend far too much time with my clients or on their engagements to be able to be hyper active on social networks. establishing your brand, connecting with the right people, engaging with them and building relationships. Salespeople are feeling the heat and need to change, but how? B2B buyers are getting tired of sales calls. Forrester rightfully pointed this out in a famous 2015 report. They even predicted that (some) sales people would disappear. Even though I’m not quite sure when this will happen. On the one hand, some traditional techniques such as cold calling are now even less effective: it is estimated that a mere 1% of sales calls lead to an appointment. It doesn’t mean that seeing more customers is useless, because without sales visits, there are no sales. On the other hand, newer methods such as content marketing are on the rise: the Content Marketing Institute indicates that it is 3 times more effective than outbound marketing. However, this does not mean that a salesperson’s aim in life is to sit behind a computer and click on links, let alone bombard LinkedIn with readymade content prepared by central marketing. Telephone technology has nothing to do with the fact that decision makers are not picking up the phone anymore. What changes their behaviour is the kind of people bothering them, and it’s understandable. There is a lot of confusion out there, but we need to fathom that tools are just tools, technology is nice but only when it’s useful and that sales and communications are two different jobs. Content marketing knows no “targets” but audiences. This is crucial. The very definition of this term by Joe Pulizzi mentions audiences (vs targets). Decision makers should not feel like rabbits in the headlights of your Range Rover. Rather than “targets”, speak to your audiences and be relevant. Content marketing works when it is authentic. Clicking on links prepared by robots will not help you get more appointments. Content marketing is an opportunity to see more customers, not fewer. Turning salespeople into marketers and vice versa means you are putting square pegs in round holes and aiming at the wrong thing. Marketing must help salespersons see more customers, and that’s what I call true social selling. Social selling, the real McCoy, does not refer to copying and pasting content that one does not understand (or even that one has not read) to submerge Web channels. Such channels are already overwhelmed with content. Besides, content effectiveness is constantly reduced by platforms via their algorithms, in an effort to protect their users and therefore their business. Finally, what is social selling? Social selling means that one should not annoy potential customers. Instead, one should offer them added value and use authentic and quality content wisely to better serve them. I emphasize here, that looking at social selling in such a way will make you see more customers, not fewer. To this end, do organize events, multiply contacts, generate incoming links, encourage potential customers to call you, and eventually, sell more. To achieve this, good sales people will need to see customers and prospects and use content marketing techniques to enrich their visitors and contacts, not to sit behind their computers. Ultimately, salespeople should not stop visiting customers; they should rather aim at seeing more of them. Use content to better your salesforce and supply them with quality content which will help them see more customers and turn sales calls into relationship-building exercises. In my view, this is the true message conveyed by Forrester’s report on the evolution of sales. Forget about SSIs, we’ve heard too much of this, let’s get back to good and serious business.